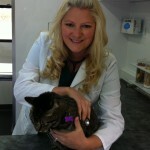 Dr. Kristie Plunkett is the best local vet you will find in the Tulsa area. A proud Oklahoman and native Tulsan, Dr. Kristie graduated from Jenks High School in 2001, and then continued on to Oklahoma State University to pursue her dreams of becoming a veterinarian. Dr. Plunkett studied Animal Science in the Honor’s Program during undergrad, and then earned her Doctor of Veterinary Medicine degree in 2008, with a focus on exotics and small animals. Since graduating, she has had the privilege of working in private as well as corporate practices where she gained diverse experience in veterinary medicine, surgery, wellness care, and exotic animal medicine. Dr. Kristie Plunkett launched Mobile Veterinary Hospital of Tulsa in August 2012 to fulfill a dream and to satisfy the unmet needs of people and their pets in the Tulsa area by providing a state-of-the-art veterinary service that comes to their front door. Dr. Kristie keeps a busy home in Tulsa with 4 cats, 2 dogs and typically has 1 or 2 foster kittens at any given time. Dr. Kristie married her husband, Dustin Hartle, in October 2012. She will eventually be changing her name to Dr. Kristie Hartle, so be watching for the name change. She enjoys spending time with her family, remodeling homes, gardening, fishing, and other outdoor activities.